Book now the best shore excursions in Alberobello. High quality and safety at the lowest prices. 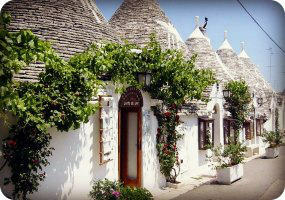 If your are looking for Shore Excursion Alberobello, book now the best guided tours at lowest price with Ancora Tours. Since 2003 we offer you official guides in english, transportation and travel insurance, all included. The highest quality at the lowest rates. If you have reached Bari, the most important city of the Apulia Region, you have arrived in the heel of the boot of Italy. Enjoy a shore excursion in the sunny town of Alberobello and discover the unique buildings named “Trulli“, declared a World Heritage Site by UNESCO in 1996. What’s eating: Taralli, a hard, circular cracker similar in texture to a breadstick or a pretzel. Souvenir: A packet of Orecchiette pasta; named after it’s shape, this pasta resembles little ears. Pair with a bottle of the region’s fine olive oil. This shore excursion of Alberobello is all about the ‘trulli’; the dry stone huts characteristic of the area. We’ll start in the neighbourhood of Aia Piccola and admire these charming buildings and their conical roofs. Originally constructed for residential use or for the storage of grain and straw, these traditional structures are now a popular tourist destination. If we examine the roofs, we notice ornaments and painted symbols. With mystical or religious significance these were meant to protect the residents living inside. We’ll continue the shore excursion in Rione Monti. Most of the trulli here been converted to craft stores and souvenir shops. A great spot to pick up something for friends and family back home. The last port of call will be the Church of San Antonio, built in 1927 in the same whitewashed ‘trulli’ style. At the end of the shore excursion we’ll return to the port.